First-time berry growers often wonder when to move raspberry plants. If your garden has become a raspberry jungle or you are eager to share your bounty with a friend or neighbor, you might not want to wait until the season is over, but your patience now will be rewarded with healthier plants and increased harvest in the future. If you move your plants when they are actively growing, you may unwittingly rob yourself of future raspberry crops by prematurely uprooting the fruiting canes. Timing the move with consideration to life stage will ensure your raspberries reach their maximum production potential without taking over your garden. 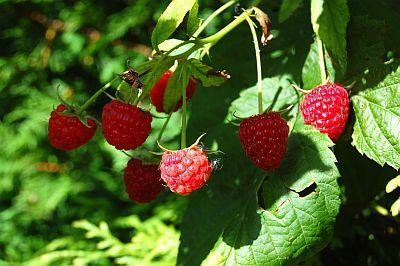 Raspberries require a bit more maintenance than blueberries, strawberries, or other fruiting bushes. While many berries and fruits can be essentially left to their own devices once established, raspberries need regular thinning and maintenance. Left alone, your entire garden may in time become one big raspberry patch. Raspberries are both hardy and easy to propagate. So easy, in fact, that they can become invasive and crowd out other garden plants, or occupy walking space between rows. Fruit picking and maintenance require ample space if you are going to comfortably move around and avoid scratches and prickles from the thorny canes. The growth pattern of the plant itself requires old canes be pruned and new suckers thinned for optimum fruit production. If you are thinning for this reason, you will know when to move raspberry plants because they will have become intrusive. Ordinarily, raspberry plants should sit in rows with each bush three feet (about one meter) apart and with as much as ten feet (about three meters) between rows. If your raspberry plants begin to grow outside of these limits, sending suckers out between the rows or forming dense hedges, you will soon find it difficult to properly maintain or harvest your raspberries. This is a sign it is time to move some of those suckers and begin a new row. When you first notice the problem, the plants will probably be in their active growing stage. Resist the urge to move them right away, instead taking the time to prepare a new bed for them elsewhere in the garden. Then, when the time is right, you will have everything in place and ready for the move. Ideally, move raspberries during a dormant period. Because the plants are not actively growing during this time, they are more equipped to manage the stress associated with the move. As they move out of dormancy in early spring, they will have increased growth hormones to help them become established in their new home. Late Autumn: By this time, plants will have gone dormant for the winter. The canes will have finished fruiting and shed their leaves. Early Spring: Move plants very early in the spring, as soon as the soil is workable but before any signs of active growth. Prune back any canes that produced fruit during the season and carefully dig up new suckers for transplanting. Gently separate the new shoots, leaving a ball of soil around the root area. Proceed with the move by planting the canes using the same method as you originally did for the mother plants. These shoots will spread quickly, so be sure to space them well apart to allow room for expansion. Of all the garden problems to have, a berry bush that grows too vigorously is among the most pleasant to manage. Simply keep an eye on your raspberry canes for signs over overgrowth and thin them out as needed, moving excess growth to a more appropriate place in the garden. Once you run out of room for your own raspberries, you can offer up young canes to friends and family for their home gardens, or move them to a community garden for all to enjoy.